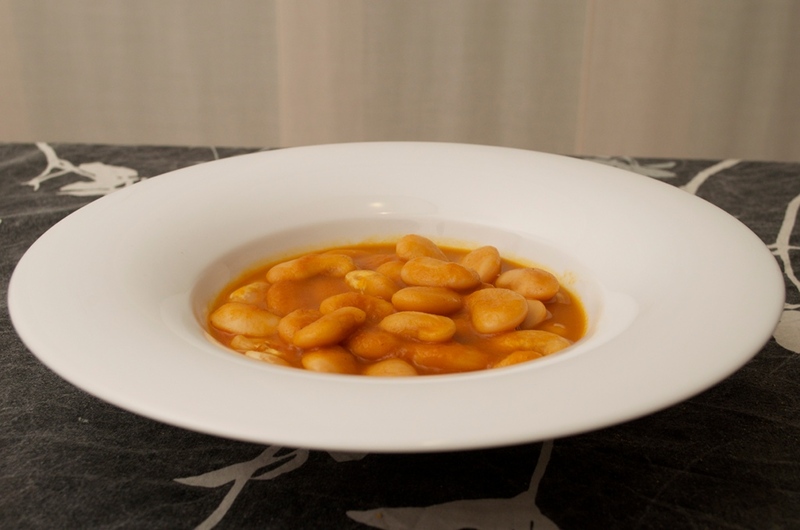 Before preparing this recipe you need to take the beans on a big recipient with triple of water, and let stay the beans a whole night in the water. Briefly chop an onion. Chop 2 or 3 leaks, you can cut them on half longitudinally and then they will be easier and faster to chop. Cut in small pieces 2 celery sticks. Remove the peduncle of 4 or 5 tomatoes and cut them in small pieces. Add a bit of olive oil in a pot, then add the onion as well as salt and ground pepper. Stir regularly and cook until the onion gets golden colour. Add a tablespoon of paprika and then add the leaks, celery, tomatoes as well as 2 garlic cloves cut in about 4 pieces. Move, cover the pot with a lid and cook for 10 minutes. Then move the content and add water, cover again the pot and cook for 30 minutes. Blend the vegetables and get them back to the pot through a chinese strainer. Help yourself with a spoon or spatula to press the vegetables to the walls of chinese strainer until inside the strainer there is almost only pulp. Add the beans, add enough water, cover the pot and cook between one hour and half and 2 hours. Check there is still water on the pot, and if you nead heat some water and add to the pot, avoid adding cold water because it will cut the beans baking process. 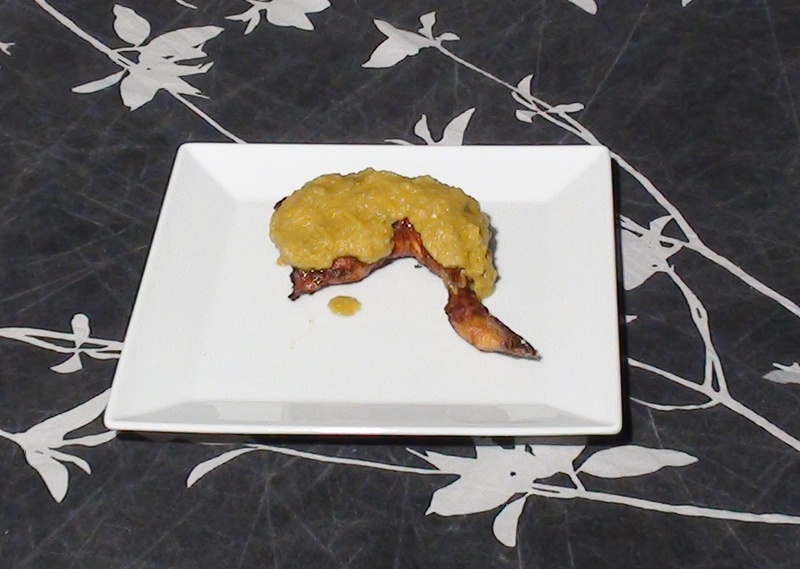 I was watching on TV Man vs food, and a recipe catch my attention, unfortunately as I was doing other thing I was not able to pay full attention to it, so I did it with some inventions on my own; but despite this, the recipe is great. I really like the way combines the hot chicken with the sweet sauce, making it even suitable for people who don’t enjoy hot food. On a bowl add 2 tablespoons of harissa, a bit of salt, a bit of sesame oil, 1 tablespoon of rosemary and the juice of half lemon. Mix it. Cover the chicken pieces with this sauce, better if you use a brush and make sure the whole piece is covered. Cook in the oven at 350º F (180º C) for one hour and a quarter, using the grill instead of tray so chicken will cook uniformly. You can turn off the oven after an hour and let cook the next 15 minutes with the residual heat. While the chicken is cooking you can prepare the sauce. Cut in pieces a green pepper, 2 sticks of celery and one onion. Don’t worry to much about cutting them too small because at the end we will blend them. Put some olive oil in a pan and add the onion, green pepper and celery as well as a bit of salt. Cook them for 7-8 minutes while stirring frequently. Then add 1 peach and 2 tablespoons of syrup, cook together for 4-5 minutes and stir it frequently.